with a professionally produced, slick music video that is clean and yet meets industry standards still rare in Jewish music. 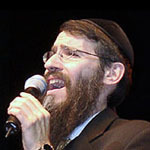 Avraham Fried, who composed the medley and words for the song, also co-produced and acted in the video which is contained in his latest CD. Light touches of computer animation and special effects are also featured, such as the letters on a page of Gemara flying off into the air. The video was produced by JewishFilms.com. Fried is proud of his mixing of modern technology with a traditional sound. "I'm a very strong proponent of keeping the music with a Yiddishe tam (flavor). Even though we're looking for new ideas and trying to be hip and cool, I think once we start losing the Yiddishe tam, then we lose our focus and the reason why we're doing this." Fried said he is excited about the future of Jewish music. Before the release of his album, he posted a sample of the “Father Don't Cry” video on the internet, created a blog and now sells CDs online as well. Although these things didn't exist when he began his career, he has excelled at incorporating them. When asked about the possibility of a Jewish MTV, he commented, "Sure, why not? We'll call it Moshiach Television - MTV. I'm not sure how long it will take. We're usually light years behind. But I think this new video clip will introduce a new dimension. More singers will do it now. I think it's wonderful. If you can see and hear, why not use all of the senses?" "The danger is," continued Fried, "if you try to get too much with the times, and try and imitate the goyishe sounds, you're putting yourself into a dangerous situation. The challenge now is to be fresh and to be creative but still not to lose the focus that this is Jewish music, and that it's meant to inspire and to give chizzuk (strength). I think the combination of the two works wonderfully -- if you keep those two things in mind."